U.S. ambassador to the UN praises Honduras for backing the U.S. decision to move its embassy to Jerusalem. 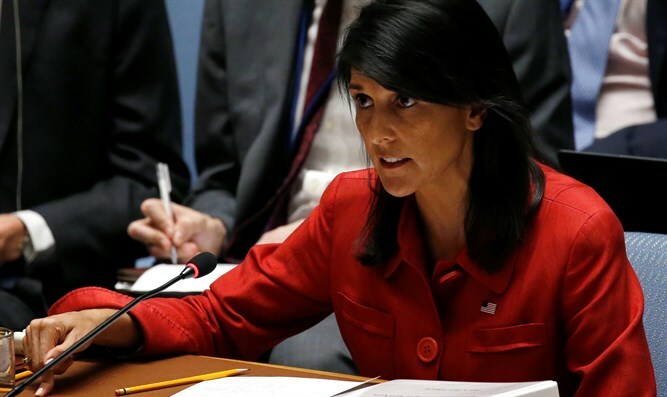 The United States ambassador to the United Nations, Nikki Haley, on Tuesday praised Honduras for backing the U.S. decision to move its embassy to Jerusalem. In a visit to Tegucigalpa to see newly re-elected Honduran President Juan Orlando Hernandez, Haley stressed that President Donald Trump's government was "committed" to Hernandez and his administration. The two countries' bonds were evident, she said, in the way Honduras voted with the United States at the United Nations in December to support Trump's plan to move the U.S. embassy to Israel from Tel Aviv to Jerusalem. "That was not an easy decision for any country to have to vote on, but the people of Honduras stood with us in being able to make that decision for ourselves and decide where we want our embassy and to know that is our right," Haley said in a joint news conference with Hernandez, according to AFP. The UN General Assembly overwhelmingly voted to condemn Trump's move, with a total of 128 of the UN's 193 member states voting against Trump's recognition of Jerusalem as Israel's capital. Honduras was one of eight countries to have voted with the U.S., the others being Guatemala, Israel, the Marshall Islands, Micronesia, Nauru, Palau and Togo. After Honduras, Haley was scheduled to visit Guatemala, which said after the vote that it would also move its embassy to Jerusalem at some point in the future. Reports in late December indicated that Honduras, as well as Panama, had notified the Palestinian Authority (PA) leadership of their intentions to move their embassies to the Israeli capital as well. The United States said last week it would relocate its embassy to Jerusalem in May, in time for Israel’s 70th Independence Day.